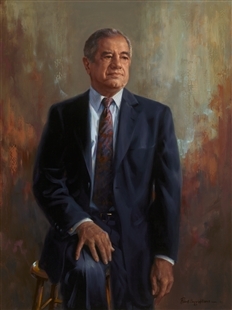 Foreign Affairs Committee Chairman Fascell’s portrait was the fifth and final portrait painted by artist Robert Bruce Williams for the House of Representatives. Williams portrayed Fascell against a colorful abstract background that is echoed in the sitter’s tie. 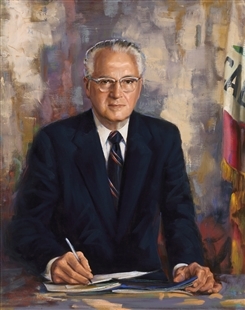 The light in the background becomes brighter in the top third of the painting, bringing the viewer’s attention to the Chairman’s face. He perches on a stool, with his body twisted slightly in contrapposto, a pose that harks back to ancient Greek sculpture and gives the portrait a sense of movement, as if the Chairman were about to stand up.